Your four-hour adventure departs Seattle and begins with a harbor cruise around one of the world's busiest seaports. 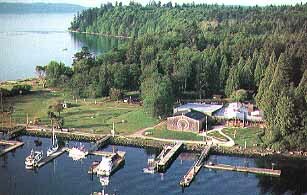 As you continue across Puget Sound, you will view magnificent scenery and perhaps encounter a sea lion, dolphin, or soaring eagle. Tillicum Village's "longhouse" is styled in the fashion of the ancient dwellings of the North Coast Indians. Tillicum welcomes tens of thousands of visitors annually and has hosted leaders from around the world. You will savor delicious fresh Pacific salmon prepared on cedar stakes over alder fires, the traditional method, as well as clams, fresh salad, wild rice, among other menu items. Enjoy the Tillicum Village dancers. The experience leads visitors through an enchanting tour of the customs, beliefs, and dances of the Northwest Coast Indians. The entire island is part of Blake Island State Park.